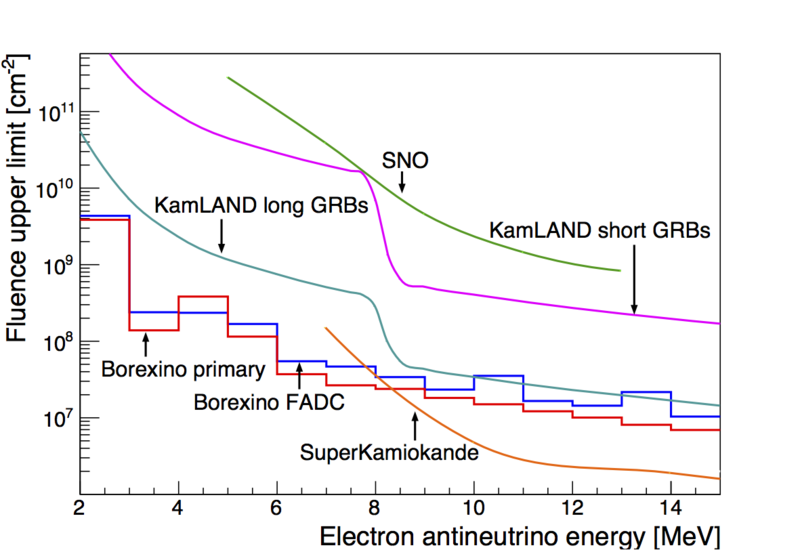 On January 2017 the Borexino collaboration published [Astroparticle Physics 86 (2017) 11-17] the result of the search for neutrino and antineutrino events correlated with 2350 gamma-ray bursts (GRBs). The search was performed over Borexino data collected between December 2007 and November 2015, and no statistically significant excess over background was observed. Our analysis combined for the first time two semi-independent data acquisition systems: the primary Borexino readout optimized for solar neutrinos up to a few MeV, and a fast waveform digitizer system tuned for events above 1 MeV. The above plot (as given in Fig.2 of our paper) shows the fluence upper limits for electron antineutrinos from GRBs versus antineutrino energy, considering the detection through Inverse Beta Decay interaction. The Borexino results are shown in comparison with results from other experiments such as SuperKamiokande, SNO, and KamLAND. Here you can find our result, as depicted in the plot, for both the Borexino primary data acquisition and Borexino FADC analyses. This detection channel was possibile only thanks to the particularly radio-pure scintillator of Borexino. This plot (the same as given in Fig.4 of our publication) shows instead the Borexino 90% C.L. fluence upper limits obtained through neutrino-electron elastic scattering for (black line), (red dotted line), (blue line), and (green dotted line). 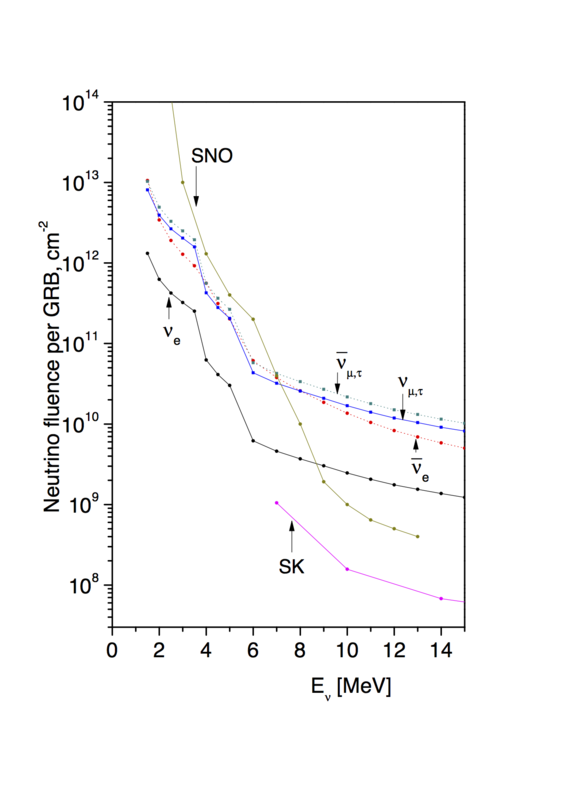 Limits for given by SNO and SuperKamiokande are depicted as well. Related Borexino data can be found here.